Tim Fallis focuses his work on the rhetoric and media studies sides of the communication discipline and has published in the areas of political advertising and political debate. He did his dissertation work on the modern phenomena of Evangelical self-referential humor, using Bakhtinian carnival theory to understand how some Christian communities increasingly make fun of their own practices in order to more fully integrate secular life with Christian ideology. 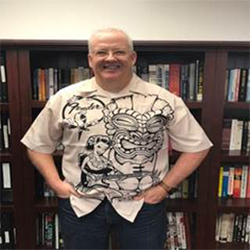 Formerly a master machinist working in Silicon Valley and then Hilo, Tim has particular affinities for both the Hawaiian college experience and for students who, like he did, start college later in life. He is absolutely delighted to be a teaching professor, taking equal pleasure in sharing his love of learning and helping students develop skills they can draw on throughout their lives. While he teaches a wide range of courses, his overarching pedagogical interests are making sure that students can express themselves coherently and that they leave his classes able to discern, resist, and deploy persuasive rhetoric to their best advantage. The chief joy of Tim’s life is his longtime marriage to Leticia, with whom he enjoys traveling and adventure of every kind.